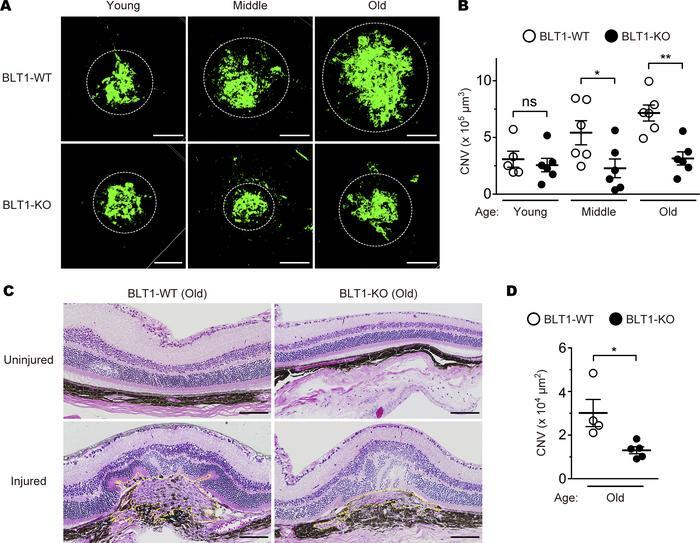 BLT1 deficiency attenuates CNV in a mouse model of AMD. Images of isolectin B4 (iB4) staining (A) and CNV volume (B) in the RPE-choroid complex from the eyes of BLT1-WT (open circles) and BLT1-KO (filled circles) mice after laser-induced injury. Green represents a CNV area positive for iB4 staining. Mice were grouped by age: young, 8–12 weeks old; middle-aged, 20–24 weeks old; old, 40–48 weeks old. n = 5–6 mice per group. (C and D) Images of H&E staining (C) and CNV lesion area (D). H&E staining of the uninjured and laser-injured retinas from aged BLT1-WT and BLT1-KO mice (>40 weeks old). Yellow dotted lines denote the lesion areas. n = 4–5 per group. Scale bar: 100 μm (A and C). (B and D) *P < 0.05; **P < 0.01 (1-way ANOVA with Bonferroni’s post hoc test [B] and Student’s t test [D]). Results are representative of at least 2 independent experiments.